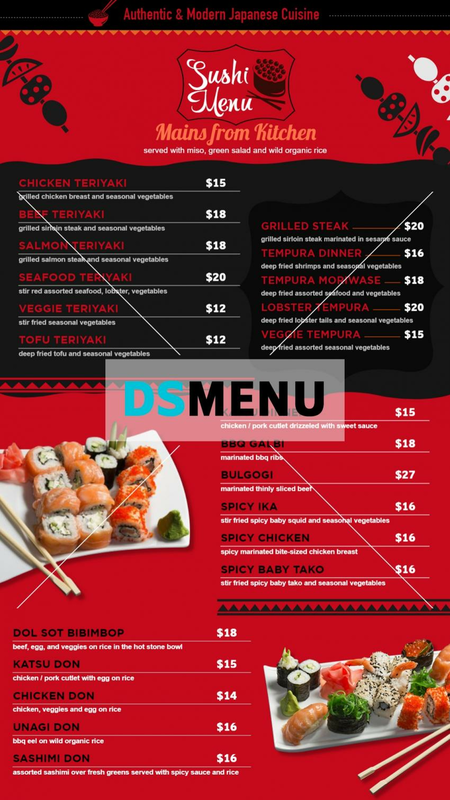 The dominant red and black colors with white lettering make this a profoudly traditional Japanese cuisine menu board. On a digital sigange menu board, the colors will be outstanding and attract all those who love Japanese cuisine. The graphics too contribute to the refinement with items depicted on a tray with chopsticks. The menu comprises of a delicious spread and include variants in Teriyaki, , Steaks, Tempura, Bulgogi, Ika, and Tako. All very Japanese, and popular worldwide !